Viruses have been infecting all forms of life – from single-celled bacteria to humans – for as long as there has been life on Earth. Because of this, ancient mechanisms of virus resistance co-exist in our bodies alongside our more-recently evolved and highly sophisticated adaptive immune system. 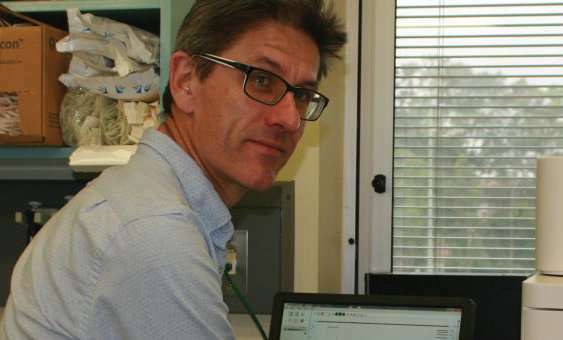 Scientists at the Centenary Institute have gained new insight into the never-ending arms race that has been fought against viruses for hundreds of millions of years. The research has been published today in the PNAS journal. Centenary's DNA Repair Group led by Dr. Chris Jolly have discovered that the enzyme SAMHD1 not only limits the supply of nucleotides to viruses inside infected cells, but also limits the supply of nucleotides to our own DNA synthesis enzymes inside B cells when they are responding to infection in other cells or responding to vaccination. This makes DNA repair inside the responding B cells particularly error-prone, ensuring that they rapidly accumulate mutations in their own antibody genes, accelerating the production of highly-protective antibodies. "To proliferate and cause disease in any organism, viruses need basic DNA building blocks called deoxynucleotides. To minimise virus replication, cells from worms all the way to humans use an ancient enzyme called SAMHD1 to limit deoxynucleotide concentrations to a very low level. This inhibits virus replication. Suppression of deoxyucleotide levels by SAMHD1 is relaxed just sufficiently to allow our own DNA to be copied when we need to produce new cells for tissue growth or repair," says Dr. Jolly. "As well as using SAMHJD1 and other enzymes inside cells to fight viruses, humans and most other vertebrates make antibodies that can neutralise viruses outside cells to prevent cell entry in the first place. Antibodies are made by specialised white blood cells called B lymphocytes. During infections, B lymphocytes making antibodies specific for the invading virus to mutate their antibody genes at extremely high rates. This uniquely modifies the structure of the antibody that each B cell makes. Competition between mutated B cells to collect virus particles then select for the few B cells that make improved antibodies; the selected B cells become especially long-lived, giving us lifelong protection against repeat viral infection. This process of evolution on speed-dial takes just a few days." This new insight and discovery by Dr. Jolly and his team including Dr. Eddy Thientosapol is part of ongoing research by the Centenary Institute's scientists in their quest to better understand disease and find cures for some of the most chronic conditions that impact human health globally. The DNA Repair Laboratory is part of Centenary's Immune Imaging Program headed by Professor Wolfgang Weninger. The Centenary Institute is a world-leading independent medical research institute with more than 30 years experience and knowledge guiding our life-saving research, which is focused on three key areas: cancer, inflammation and cardiovascular disease. Our strength is in uncovering disease mechanisms and applying this knowledge to improve diagnostics and treatments for patients by understanding disease and finding cures for some of the most chronic diseases affecting today's society.